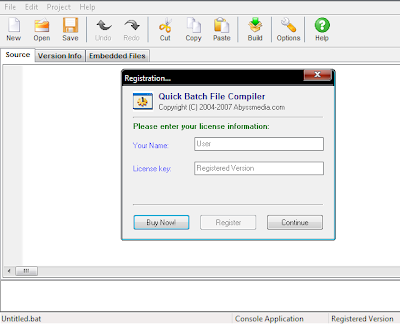 Quick Batch File compiler converts your batch files into actual programs (EXE format) in one click. This program may be run on Windows 95/98/Millenium/2000/2003/XP without any limitations. Content of your batch file will be encrypted and protected from changes. Protects contents of a batch file from the non-authorized change . Hides contents of a batch file from viewing. Keep your secrets! It is not necessary to be the programmer to create the program. It is very useful to installation and automation tasks. Can set an icon, include version information and additional binaries to your program.